You no longer have to worry about the time wasted or the hassle of filling out FOIAsthrough the FDA for copies of Form 483s. 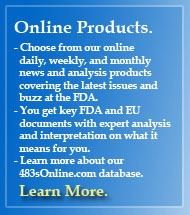 With a membership to FDAnews’ 483sOnline.com, you’ll get unlimited access to more than 1,300 Form 483s at your fingertips. 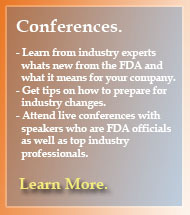 Ever want to take your employees inside an FDA inspection interview to show them exactly what can go wrong – and how to avoid these mistakes? Now you can. This time-tested solution to one of the biggest inspection prep challenges any company faces will lead your employees through the scenarios that can take an inspection off-track – and show them the right way to handle the situations they’ll face when sitting across the interview table from the FDA. 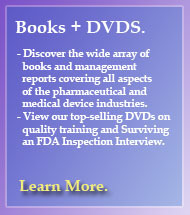 This instructional guide and DVD creates a powerful, hour-long training event that shows employees the types of questions and tactics they’ll face during inspection, and gives them the confidence to respond correctly. March 11-12, 2014, Waltham, MA — Nothing gets you in hot water faster than a botched response to a customer complaint. You think you’ve made all the right moves, but chances are you haven’t. You need a system. You need a plan. * 20% discount applies to new orders only and cannot be used for existing orders or subscription renewals.